Gently Pour Lemon Lime Soda over the sherbert. It will develop a nice froth to it. Gradually sprinkle desired amount of edible gold star sprinkles for extra flair. 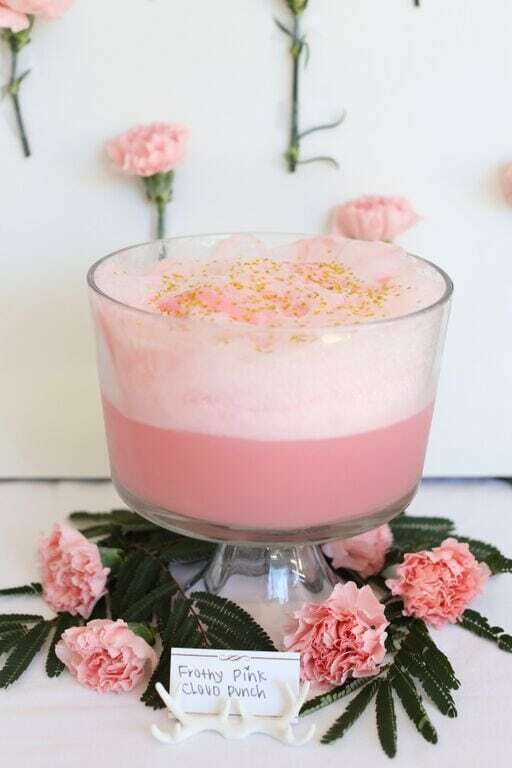 This Easy Dreamy Pink Froth Punch recipe was developed in collaboration with Melissa Johnson + Confetti & Bliss for Melissa Johnson’s baby shower. Having an impossible time trying to find raspberry sherbert, but I have found a ton of raspberry sorbet. Is it ok to use sorbet? Pingback: 8 recipes for perfect party punch. Say that 10 times fast. what are the amounts of the ingrediants? Where did you find that punch bowl? That looks more like a trifle bowl and they’re everywhere. Where do you get the edible hearts? Wondering if this will taste good using orange sherbet? I have tried it this way and it was soooo good! How much sherbert and lemon lime soda? I made this punch at a baby shower everyone loved it, it was delicious. It is so easy to make. So beautiful. Thanks for sharing this amazing article. I have been also referring to https://www.whattoexpect.com/pregnancy/ for everything related to pregnancy and babies, and it is quite useful. Hope this helps your readers as well. I love the pink! Perfect drink for a girl’s party!